Well, most of the girls go wrong when it comes to picking the right shade to get a smokey look for their captivating blue eyes. It is important to choose a contrasting color that can make the peepers even more dramatic and here is the actual trick! It might be tempting to use black for blue eyes, but in reality it is not at all happening. Simply select ‘brown’ over ‘black’ and experience the magic! After sorting the color, find out the products that you will need on the go. Get kohl pencil, eye liner, eye shadows and mascara. As said before, all of these should be brown in color, while the shadows can also be light blue and silver. You will also need a concealer to jazz up your smokey eye makeup. Trust me, the marks under your eyes that are proving how many sleepless nights you’ve spent are not just okay to get your desired look. Those peculiar puffs beneath your blue eyes also do not go with the smokey look. So, put the concealer to your best use and get rid of both dark circles as well as eye bags. Eyebrows are crucial for making the most of an eye makeup. Hence, do not forget to do your eyebrows properly. In addition, those having thin brows should always opt for a black brow pencil in order to give those a bit volume. Now, it is time to contour both of your eyes perfectly. Do it with the kohl pencil. But wait! You do not need to outline the whole eyes as it would turn them into smaller ones. Just swipe the pencil gently along the external angles of your peepers and you are done. A liquid liner is always the best tool to make our eyes stand apart from others. But if you are a beginner with shaky hands, go for its non-fluid substitutes. The procedure for drawing your eyes with the product is more or less similar to what needs to be followed for the kohl pencil. 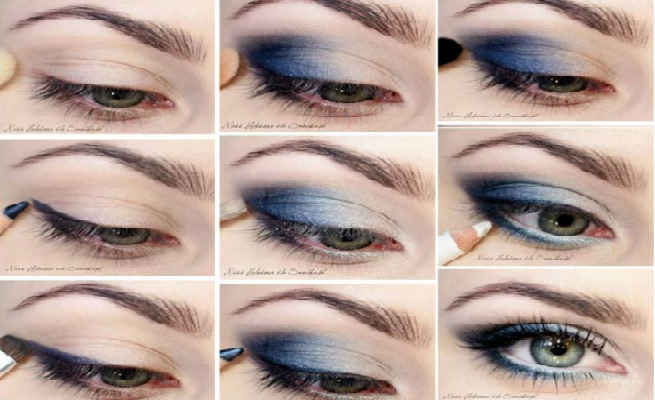 Take an eye shadow brush and apply some light blue shadow around the outer edges of your eyes. Smudge it on gradually and carefully towards the inner edges. Also, apply a little sliver shadow to the middle of the eye lids and merge it with the previous one smoothly. You have to make sure that the shadows are put over the lines drawn with the kohl pencil. Finally, apply the mascara to your lashes along the borders of the lids. It should be a thick coat and you must carry it out cautiously.